The second generation Corvette was introduced in 1963 and named the Corvette Sting Ray. The Sting Ray was developed with a new chassis, independent rear suspension and two available models, the convertible and sport coupe. The 1963 Corvette Sport Coupe is also known as the "split window coupe" and is very unique for being the only model year to have two rear windows. The 1963 Corvette was also available with four 327 cid engine options that provided performance ranging from the standard 250 hp engine to the maximum performance 327 with the 360 horsepower fuel injected L84 engine. The famous Grand Sport Corvette race cars were also created in 1963. The Grand Sport Corvette was produced with a bored and stroked motor that resulted in 377 cid, with aluminum cylinder heads and hemi combustion chambers power output was 550 hp at 6400 rpm. This race Corvette was produced with special suspension components and fabricated for reduced weight, with cars weighting from 1990 to 2100 pounds. The 1963 Grand Sport race cars proceeded to make history by generating impressive wins in racing competition. There were only five 1963 Grand Sport race cars built which makes these five factory race cars very special Corvettes. 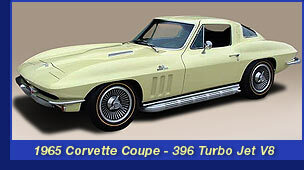 Enhanced styling and refined engineering improved the 1964 model Corvette. The Sting Ray coupe’s rear window was replaced by a one piece glass, providing better visibility over the split window version from the previous year. The 1964 model Corvette had a maximum power rating of 365 horsepower for the carburetor equipped L76 engine and 375 hp for the fuel-injected L84 engine. The 375 horsepower Corvette provided serious performance by producing 0-60 mph in 5.6 seconds. The 1965 Corvette was the first model to receive the Chevrolet big block engine option with a 396 cid L78 engine rated at 425 hp. A special bulged hood was required for the Sting Ray to accommodate the 396 cid big block engine. The Chevrolet big block engine also required a heavy duty clutch and a larger radiator. The 1966 Corvette was offered with two 327 cid engine options and the new 427 cid big block Chevrolet engine was available with 390 hp and 425 hp engine options. The 427 cid big block Chevrolet L72 engine was initially rated at 450 horsepower and later reduced to 425 hp and 460 lbs/ft torque. The “427 Turbo Jet” emblems and the big block hood bulge identified the new engine which was capable of 0-60 mph in less than 5.0 seconds. The 1967 Corvette Sting Ray represents the ultimate in performance and styling for that era and one of the most classic Corvettes ever produced. 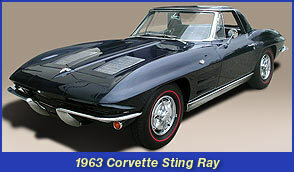 It was also the last year for the 2nd generation Corvette Sting Ray. 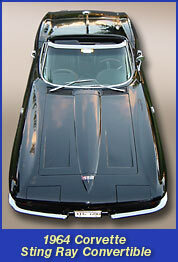 The re-styled hood with stripes indicated that the Corvette was equipped with a 427 cid big block Chevrolet engine. Chevrolet offered a radical L88 engine option that was rated at 425 horsepower but really produced 560 horsepower with 12.5 compression ratio. The 1967 Corvette L88 is a very powerful and rare Corvette with only 20 cars having been produced. The L71 engine option is a 427 with 3 x 2 barrel carburetors rated at 435 horsepower at 5800 rpm. The L88 engine option for the 427 engines comes with aluminum heads and 12.5:1 compression ratio. Power is conservatively under rated at 430 hp at 5200 rpm and 450-ft-lb torque at 4400 rpm. ¼ mile mph 114+ mph - est. Top speed 155+ mph - est. Rolling Thunderz technologically advanced performance modifications for 1960’s era Corvette engines provide dramatic power and performance enhancements. This 1964 Corvette is powered by a Rolling Thunderz small block Chevy 327 engine that uses a production 327 block and production cast iron double hump cylinder heads to produce over 500 horsepower on pump gasoline. The Rolling Thunderz powered 1964 Corvette runs 11.8 second elapsed times at 118 mph at the drag strip making it one of the World’s Fastest Street Legal Generation 2 Corvettes that uses the production OEM 327 engine block and cast iron OEM cylinder heads.